The area around Lifjorden has a lot of history, culture, and beautiful nature to offer. You can experience something new and different every day! A majority of our guests return to Risnes year after year to experience the mix of the fjord along with the mountains. Lifjorden has outstanding fishing conditions and on the main land you will find incredible hiking terrain with marked trails. It is a spectacular experience to climb the Lihesten Mountain which is 777 meters above sea level. 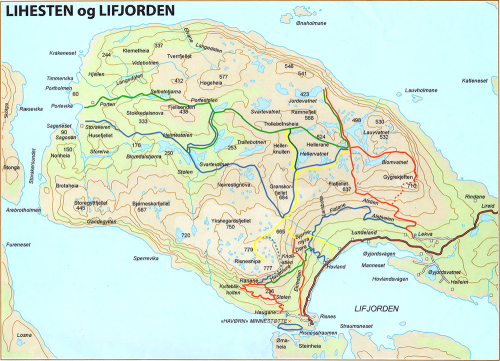 Map over Lihesten og Lifjorden. Risnes is situated eight kilometers from Hyllestad where you will find a grocery store, a gas station, medical help, and much more. One will also find the Kvernstein museum containing the history of mill stone production in year 1000 AC. It is not far from Risnes to other towns like Leirvik and Sørbøvåg.